Life is full of expectations. Every day we have a sense of how we think that day is going to go (or at least how we hope it would go). And for most of our lives, one day after another follows just as we feel it should. Sure, the car breaks down, the dog gets sick, a work schedule changes unexpectedly. But even those “unexpected” events are still within the realm of what we can accept as a normal part of our day-to-day life and routine. It’s only after a sudden loss, or only when it’s someone young who has died, or only after an especially tragic death, that expectations shatter. But the truth is it can happen to anyone. For any type of loss – no matter how old the person was at the time of their death, no matter how long they were sick for, or for however long a person had time to prepare. For pretty much every griever I’ve ever spoken to the loss of their loved one shattered the expectations of how they thought life was supposed to be. Because it’s not “just” one person or one event, it’s about what’s fair, what’s right, and how we think life is supposed to be. It’s also about taking everything we thought we knew, understood, and could handle, and turning it completely upside down. That seems to be a big part of it…what we think we can handle. Just like everyone thinks of themselves as a good driver, I believe most people see themselves as emotionally strong and capable, and mostly able to handle whatever should come their way. But loss changes everything, and as grief takes hold and zaps us of our energy, our logic and the traits that have gotten us through tough times in the past, we realize that we are at the mercy of something much bigger than we ever could have expected. It’s seems these shattered expectations can come in many forms. There’s nothing like grief to show us the limitations of human beings. People fail us constantly as we grieve and it’s hard not to be disappointed. Even if we do have it in us to understand, we can still wish that people were better at supporting us when we need them most. And for some the surprise comes from how they really feel after the death of a loved one. I find this especially for those who had an expected loss. They thought they knew how they were going to feel, and yet the reality is so very different. But how are we supposed to know? What does it REALLY feel like to lose a parent, child, spouse, sibling or friend? Is it something we can ever possibly prepare for, and isn’t the reality almost always different than we thought it was going to be? So to add to the list of why grief is so hard, and why it lasts so long is this: grief changes everything we thought we knew about our life and the people in it. And one of the biggest things we lose is the belief that so many people (before their loss) carry: that things happen for a reason and they all seem to work out in the end. It seems that most grievers are expected to accept their loss at some point or another. Though the truth is that we may never really be able to accept the harsh realities of life and living, especially when we have been given more than our fair share of pain. Not accepting it. Maybe that’s a crazy idea, and it certainly falls outside the lines of the stages of grief and what most people expect a griever to do. But let’s think about this. Maybe we don’t have to be okay with what life throws at us. Maybe we’re allowed to think that life is unfair and pretty terrible sometimes and maybe we’re allowed to be disappointed with people and with the way things have turned out. The key is recognizing that it doesn’t mean we can’t move forward. Those feelings of disappointment and of yearning for things to be different can still co-exist with hope and faith too. 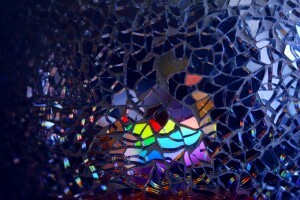 Here’s the thing about the word “shattered”… unlike something that has been broken, it can’t ever really be put back together. It doesn’t break neatly or into even pieces. Some piece is always lost, and even when attempts are made to glue it back together, it never quite fits. In the same way, we can’t always make our life look the way we had hoped it would..
Grieving the loss of someone we love is about change but it’s also about making room- for new thoughts, new (and very conflicting) emotions, and sometimes a new way of seeing things. While it may not be what we expected, and while we may never feel that we can accept the loss of our expectations for life, maybe we can make room for both sadness and hope as we look to the days ahead. Sometimes we can be disappointed with the lack of grief support available, making a tough time even harder when we don’t know where to turn. That’s why www.griefincommon.com was created. We are a website dedicated to helping people with loss and grief, and making connections with grievers based on the experiences they share. Find help…join us today. Thank you for this beautiful article. I can certainly identify wwith much of what has been written. We never heal but do try to move forward, even if it’s a snail’s pace.